Wichita Falls location only. Expires 1/31/15. Can not be used towards the purchae of alcohol. One year after the onset of the Mexican Revolution Miguel leaves his beloved town in Mexico and arrives in Dallas in 1910. In 1918 – When Miguel Martinez (founder) opens “Martinez Café,” he offers only Anglo-American dishes. He develops a new style integrating Mexican flare and offers these dishes to guests for their comments. Their input was instrumental in perfecting his culinary experimentation. Tex- Mex is born. 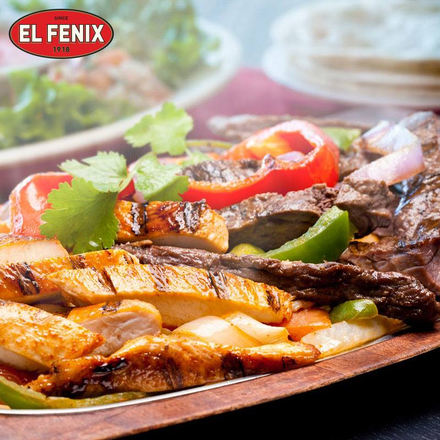 El Fenix, the oldest Mexican Restaurant chain in the United States, marks another milestone in 2009 – 90 years of service to the Dallas / Fort Worth community. Four more stores open: Lewisville in 2000, McKinney in 2001, Irving in 2009 and Denton 2010.